We have a team of design engineers are dedicated to creating custom gaskets and custom seals specifically for your application. Our custom rubber products are used in many different industries; Aerospace, Military, Defense, Industrial, Automotive Semiconductor and more. Contact us if you have a product that needs a custom gasket or custom seal. 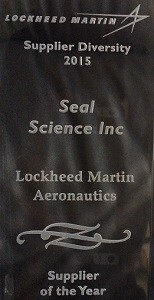 Seal Science is a dedicated engineering and manufacturing resource for a wide range of fabric and rubber aircraft seals. We design these custom seals specifically for your requirements. Elastomers like high temperature silicone, fluorosilicone, nitrile and fluorocarbon can be reinforced with polyester, wire mesh, fiberglass, nylon, Nomex®, Kevlar® and more. PTFE seals are designed for dynamic, high pressure and high temperature environments where a rubber seal or gasket would fail. Polytetrafluoroethylene (PTFE) maintains a low coefficient of friction and a high chemical resistance for the most aggressive applications. 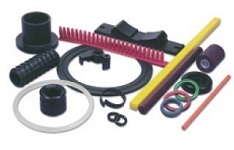 PTFE can be used with a variety of fillers or as the jacket for a spring energized seal. We have been manufacturing and designing custom gaskets for over 30 years. With experience in die cutting, rubber molding, and water jet cut gaskets we can meet any requirements that you have. We specialize in precision rubber products and are able to hold our custom gaskets to extremely high tolerances. Standard or custom compounded materials available. A rubber to metal bonded seal can be a simple mold-in-place gasket or a complex multi material custom seal. We use precise co-molding processes to vulcanize a rubber seal directly into a non-elastomeric carrier or insert. This rubber to metal bonding process creates a chemical bond that is far superior to that of adhering an already cured rubber product to a substrate. Seal Science has design engineers, material specialists and chemists on-site to help with your custom engineered solution. Our rubber compounds are mixed and tested in our laboratory and our process engineers are always developing new manufacturing methods. 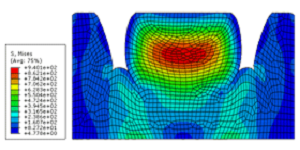 For complex problems, Seal Science utilizes finite element analysis to design a perfect sealing solution. Our conductive EMI gaskets and seals are engineered to provide both environmental and EMI, ESD and RFI shielding for critical applications. We have a large variety of EMI gasket materials to ensure the best rubber product for your mission environment. Silicone, fluorocarbon and neoprene filled with carbon, nickel coated graphite, silver coated aluminum and more. Seal Science incorporates many types of manufacturing processes to fabricate our custom molded products. Compression, transfer, injection, and hand lay-up molding techniques allow us create the most economical custom rubber molded part to meet your requirements. Silicone, Fluorosilicone, Isoprene, Nitrile, Neoprene, EPDM, Fluorocarbon and more. Seal Science offers plastic injection molding for seals and components in any high performance plastic, thermoplastic rubber or urethane. Plastic injection molding is perfect for when you need thousands or millions of identical parts produced in the most cost-effective method. Industries include aerospace, defense, automotive, medical and industrial.